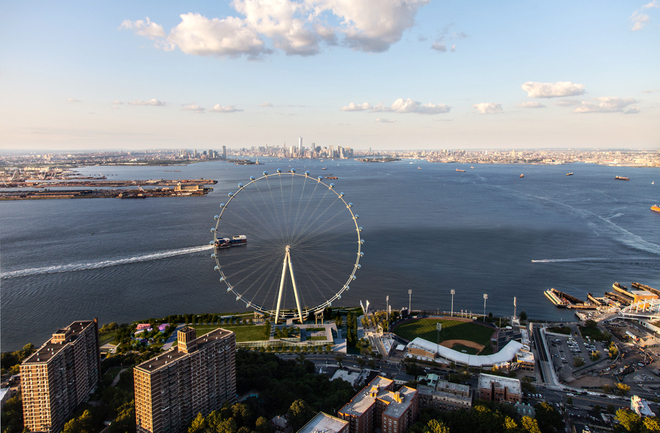 By the time Staten Island’s giant observation wheel finally opens in 2017, it may not be the tallest in the world. But right now, its planned 625-foot height tops all other Ferris wheels, and its views, unsurprisingly, have been touted as the main attraction. (Along with the promise the project, along with its neighboring outlet mall, holds for revitalizing St. George, the area by the Staten Island Ferry Terminal and the Staten Island Yankees’ stadium.) While we await the wheel itself, enterprising Staten Island resident Scott Grella sent a drone up from the site to scope out the views during a particularly lovely sunset. First, the rest of the city, while beautiful, looks mighty tiny and far away. Second, just remember that because of FAA regulations, the drone couldn’t fly all the way up the wheel’s highest point. Third, seeing these views when the wheel is actually built will be costly as heck: $25, $35, and $45 depending on when you go, with the ticket price escalating as the day turns into night. Run to get PEARL today!